But what type of sign is right for your business? That can be a lofty question: with so many options out there, it can be hard to know which type of sign is best suited to your unique business. However, by taking a few moments to really evaluate your needs, you may find that the right kind of sign is much easier to identify. In this post, we'll discuss some of the important things to consider when choosing signage, which will help you choose the best type of sign for your business. For customers trying to find your business, whether it is on a trade show floor, a street festival, or driving by, signage can be a vital way for your customers to find you and guarantee that they won't get frustrated and keep on moving. You never know when your sign might catch the eye of someone driving or walking by who just so happens to need your service or product. You can project a little bit of who you are by sharing your logo and basic business information via your signage. It can also be a space to showcase sales or specials. With a memorable sign, you will remain in people's memories. When it comes down to it, the right sign will be a matter of your choosing. However, this list considerations and questions to ask yourself about your signage needs may help clarify your vision and help you choose the right sign for you. How much space do you have for a sign? 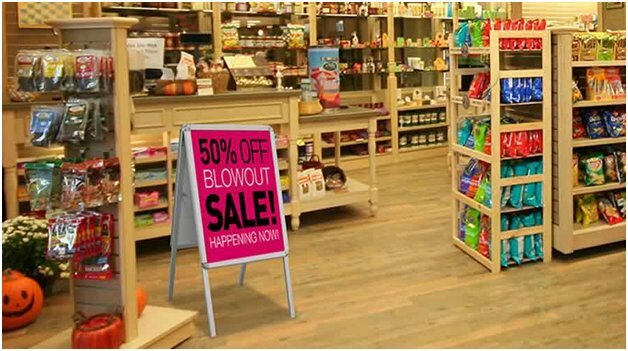 How much space is available for displaying your sign? While this might not help you decide exactly which sign you need, it can filter the signs that are available within your size needs. Where will the sign be physically displayed? This can affect the proper scale of your sign. For example, the same A-frame sign that works beautifully at a casual sidewalk market will be much less effective to advertise a huge auto sale, which may be better suited to flying flag banners. Will the sign be static, or will it be moved? Will the sign remain in the same location, such as in front of a retail store? A weighted water base outdoor sign might be a good choice, requiring only that you fill the base every now and again to keep it weighted. Or will it have to be moved nightly or at the end of an event and then re-set up? A retractable banner or Fabsta stand might be a better choice. Will the sign be indoors or out? 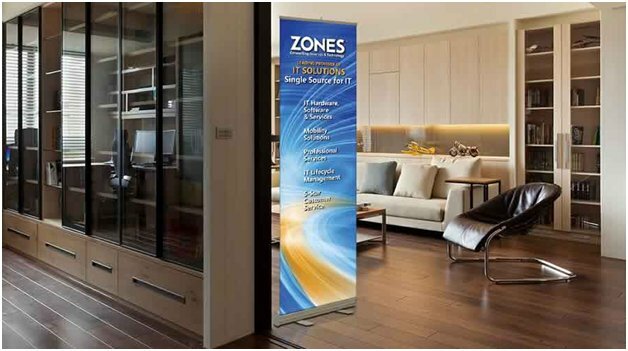 Whether the sign displayed indoors or out is an important consideration when choosing a sign. 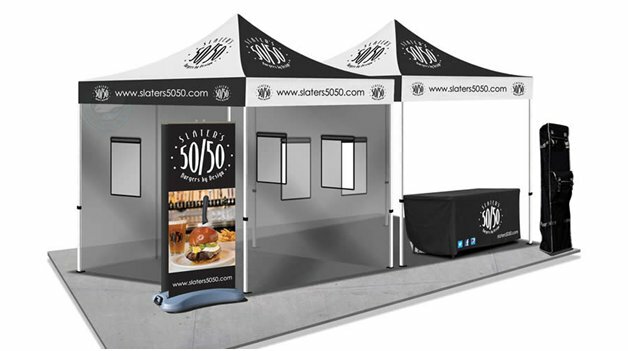 For outdoor signs, you have to make sure that the sign has some aspects that will protect it from wind and rain; depending on the event, a pop-up tent with your logo might be the best solution. Signs also have to have a heavy base to prevent them from blowing over; a Springster or Frog display works well in this case. Do you want to use the sign for trade shows? If you want a sign that will work for trade shows, either solely or in addition to a retail setting, you'll have to consider the style and setting of the show, but also any size or weight restrictions. For instance, some trade shows ban overhanging displays or signs blocking the aisle ways; you'll want to make sure your sign doesn't violate these codes. But on a more common sense level, what will fit in your booth? A booth kit designed for common trade show booth sizes can be an easy solution in this regard, with a complete kit which can be fitted to your booth specifications. What are your goals with the signage? What specific goals do you want to meet with your signage? Is it meant to draw in people from across the lane on a highway? In that case, a large outdoor flag or banner might be a good choice. Is it to draw in passersby from a busy street to your location on a side street? A human directional sign might be a more effective tool. Are there any applicable regulations? Find out if there are any specific rules about signage where your business is (or at your trade show or event). Sometimes, there are rules about the dimensions and setup of signs, so be sure to adhere to these rules. 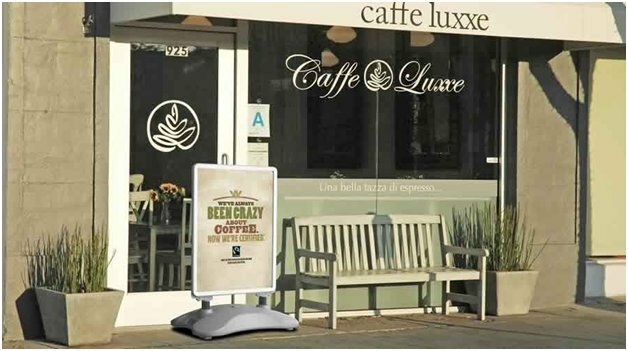 Once you've evaluated your needs, you can begin seriously thinking about what type of signage to purchase. By taking a few minutes to think about the above considerations, you'll likely have a lot more clarity on what types of signs will meet your needs. You can reach out for a quote on the type of signage you'd like to pursue! Conclusion: Settling on the best type of sign for your business can be an intimidating process. However, when you take a few moments to think about the considerations listed in this article, you may gain more clarity on your needs. It's worth taking the time to figure out what type of sign is best suited to your business so that it can have the maximum effect. What type of signage does your business employ?